If we stopped to take a photo every time we saw something beautiful or inspiring whilst crossing the Wolds, we’d never get anywhere! This morning, though, we came across such an impressive sight whilst driving to work that we just had to pull over. 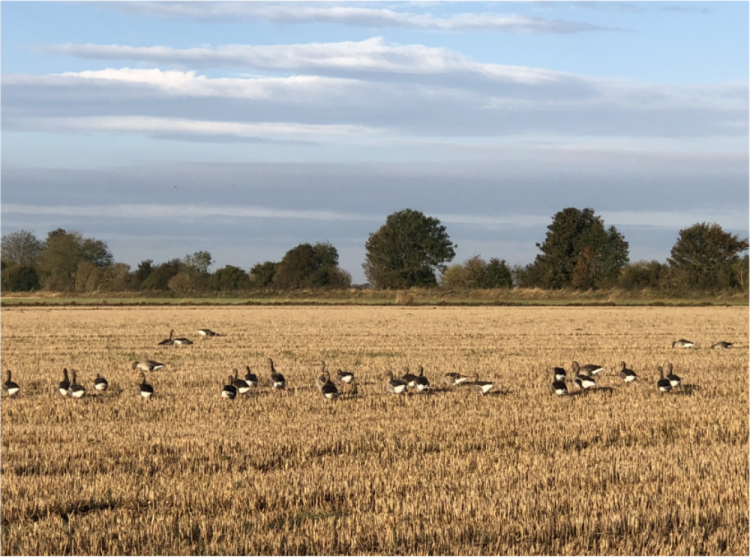 It’s hard to capture the scale of it in a photograph but dotted around a recently-harvested stubble field grazing, was the most enormous flock of wild geese. There must have been approximately two hundred geese altogether, resplendent in the glow of an autumnal Yorkshire morning. A few minutes later whilst continuing our journey, the flock of geese flew overhead. An incredible sight to behold. Whether the flock was resident or whether they were nearing the end of a very long journey, migrating south for the winter, is unclear but we’re glad we were there to witness it, along with the many other wonderful wildlife there is to see in this stunning corner of Yorkshire.